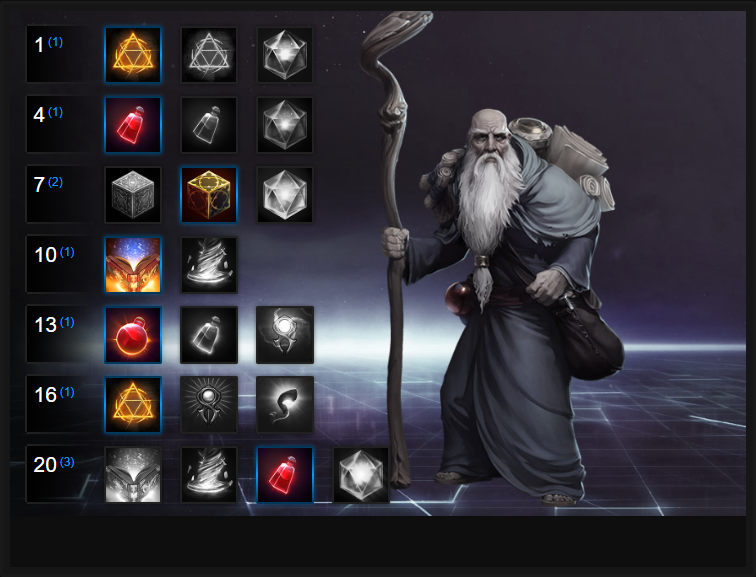 In this Deckard Cain Build Guide, we provide an overview of his strengths, abilities, talents and matchups. Deckard Cain is a Support Hero that falls somewhere between Medivh and Brightwing. His kit offers incredible amounts of crowd control and sustain, but this is largely at the expense of mobility. With his primary heal - Healing Potion - requiring interaction, and having to be thrown, Deckard excels at fighting in an area, without too much travel. Armed with 5 Healing Potions, his healing potential is high, but he's also limited by their recharge rate and delivery. In the right hands I've found Deckard Cain to be particularly oppressive and similarly to Medivh, frustrating to deal with. His area denial from Scroll of Sealing combined with the slow of Horadric Cube makes him annoying to chase, and challenging to zone. It also means that when combined with his Trait, and a 50% quicker recharge on his abilities when near allies, he can bombard an area with some frequency. Although he's vulnerable to dive, and the likes of Sonya, Anub'arak and Tracer can cause him serious problems, as long as he's drafted effectively and positions himself well, he's undoubtedly a top-tier Support. Fortitude of the Faithful (Trait) - A simple yet effective Trait, Fortitude (for short) simply requires Deckard Cain to be near his allies to gain a permanent +10 Armor, as well a 50% faster cooldowns on his abilities. The radius is fairly large (about 2 units) and is highlighted the moment you begin to move near an ally. Ideally you want to keep the buff active at all times, as Deckard has long cooldowns by default, so shaving time off them is incredibly important for maintaining his healing and area denial potency. Healing Potion (Q) - Undoubtedly unique, Healing Potion allows Deckard Cain to deliver a single vial at a target location. With a throwing range only a fraction larger than his Trait, a Healing Potion will remain active until it's collected or will be consumed the moment it's thrown on an allied Hero. Healing for over 500 health at level 20 and with 5 charges, it does allow Deckard to deliver a significant amount of healing to his team. The major downside is the fact there's a 3 second cooldown between each throw, meaning that his team are vulnerable to burst damage if he doesn't already have some Healing Potions active on the ground. Ideally you want to be throwing Healing Potions down before your team take damage, in locations they can easily reach. Horadric Cube (W) - Your first and primary form of crowd control, Horadric Cube is an AOE attack that slows those caught in its blast. It can be dropped anywhere within range, and is a telegraphed ability. With a fairly large radius, there's a slight delay before it detonates, as well as a brief amount of travel time as the cube is thrown forwards. It's best paired with Scroll of Sealing so that those slowed by your Horadric Cube are also then caught by the root of your scroll. Scroll of Sealing (E) - A potent ability that offers amazing area denial - especially when fighting over an objective - Scroll of Sealing is undoubtedly powerful. Similarly to Horadric Cube, it also has an arming time, and a clear telegraph to warn enemies that it has been cast. While it's fairly easy to avoid unless slowed (that's where Horadric Cube comes in), it doesn't change the fact it's still amazing at zoning enemies. I must add that until the three areas of the triangle are completed, enemies will not be rooted or suffer damage. It's only once the Scroll of Sealing is fully formed that the effect occurs. Stay Awhile and Listen (R) - Undoubtedly his best Heroic, Stay Awhile and Listen offers incredible amounts of crowd control. With a massive radius and almost impossible to miss with, it will sleep all those caught in it. Despite a small wind-up, the sleep duration is fairly lengthy and allows Deckard's team to retreat, or target an individual Hero to burst down. Lorenado (R) - While it looks good, Lorenado is limited. Its duration is fairly short, it doesn't deal damage, and it's easily avoided. That said, it can be somewhat annoying when used in confined spaces. Despite that, with a 45 second cooldown and considering its drawbacks, any positives it does have are far outweighed by Stay Awhile and Listen. By all means have some fun with it in Quick Match, but don't take it to Ranked. Scroll of Identify is a Quest that allows Deckard to reveal enemies for 8 seconds when struck by Scroll of Sealing. While this alone is great - especially for keeping track of enemy movement - it's the bonus of completion that's important. After hitting 20 enemy Heroes, Scroll of Sealing will reduce Armor by 15 for 4 seconds, while the reveal duration is doubled. Allowing Deckard to grant a small, temporary shield to anyone who chugs one of his potions, this extra defence ensures he (and they) can withstand that little bit more damage without him having to throw another Healing Potion. Potion of Shielding is great. Kanai's Cube provides some much needed control during team fights, allowing Deckard to reduce the damage enemy Heroes deal if they're caught in his Horadric Cube. The 30% reduction is enormous and ensures a front-line that's tagged will deal far, far less. For pure crowd control, Stay Awhile and Listen is incredibly potent. Allowing Deckard to put enemies to sleep, it allows his team to escape or engage a specific target while the rest of their team are out of action. Allowing Deckard to heal for much more, Super Healing Potion does exactly what it says on the tin: it boosts the healing value of Deckard's potions by 80% if they haven't been picked up in 2 seconds. As long as you prepare your potions in advance of a team fight - typically over an objective - it gives you a massive boost. Scroll of Stone Curse once again builds on Scroll of Sealing. Boosting the damage of the ability by 200% if you hit 2 or more Heroes, it allows Deckard a pretty solid amount of AOE damage, while still rooting those affected. It won't make you the highest damage dealer on the team, but it will soften up those caught. Similarly to Rejuvenation Potion, Bottomless Flask is fantastic on Battlegrounds that require pure sustain. Braxis Holdout or Volskya Industries are excellent choices to pickup this Talent. This list of tips and tricks are just a handful of things we think will help your Deckard Cain play. We'll continue to add to the list as required and if you have any tips you'd like to share, let us know in the comments below and we'll place them here. 1. Remember that you need to stay within range of your team to gain your Trait. It's important you do so as without it, your cooldowns are lengthy. 2. Your Healing Potion can be cast on players for an instant dose of healing, but needs exceptional aim. 3. Ideally, try to unload all your Healing Potions in locations where your team will fight. There's no use placing them where they can't reach. 4. Try to always keep a Healing Potion in the bank, so you can heal yourself if needed. 5. Most of Deckard's abilities have minor delays. Whether it's Horadric Cube or Scroll of Sealing, take this into account when casting. 6. Horadric Cube can affect multiple targets. Try to aim it so the damage and slow effect hits more than one opponent. 7. Horadric Cube is your only "instant" means of escape, so it's often worth saving it against a dive heavy composition for when they try to bring you down. 8. Scroll of Sealing is undoubtedly powerful, but it has a lengthy cast and arm-time. It's often best to use Horadric Cube followed by Scroll of Sealing so that players are slowed while the seal completes. 9. Though the root of Scroll of Sealing is undeniably strong, the damage alone is high once you've Talented and completed your Quests. Use the root to control the flow of a fight. 10. Deckard works best in areas where there's little space for his enemies to move. If he has a strong front-line, he can provide oppressive area denial. 11. Stay Awhile and Listen is not just for shutting down the enemy team, but also allowing your own to burst an individual. While it's active, have your team spike one target.